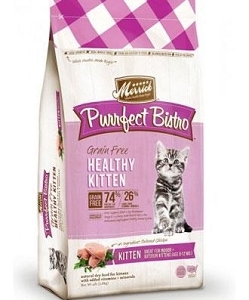 This natural, 100% grain free formula cat food is ideal for adult cats 7 years and older with a focus on supporting senior health. Deboned chicken is the first ingredient and, along with chicken and turkey meals, helps comprise the 70% protein level of meat sourced ingredients that are highly digestible and rich in essential fatty acids. Fresh produce like sweet potatoes and peas provide easily digestible carbohydrates that offer the benefit of sustained energy without upsetting grain-sensitive digestive systems. This high quality grain free diet is fortified with vitamins, minerals, probiotics, and antioxidants. 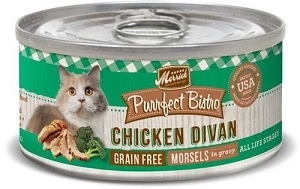 That's why Purrfect Bistro Grain Free Healthy Senior Chicken Cat Food provides balanced nutrition using real whole foods sourced from local farmers. 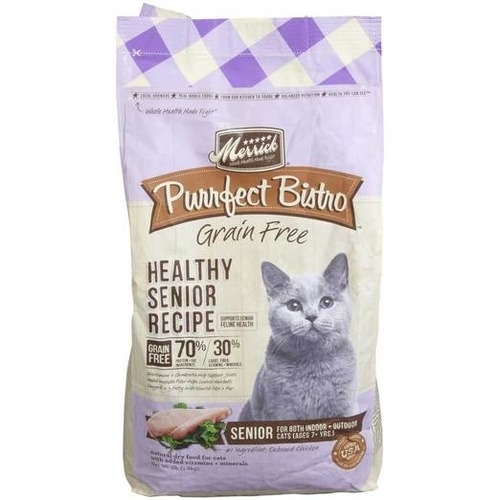 This natural, 100% grain free formula cat food is ideal for adult cats 7 years and older with a focus on supporting senior health. Deboned chicken is the first ingredient and, along with chicken and turkey meals, helps comprise the 70% protein level of meat sourced ingredients that are highly digestible and rich in essential fatty acids. Fresh produce like sweet potatoes and peas provide easily digestible carbohydrates that offer the benefit of sustained energy without upsetting grain-sensitive digestive systems. This high quality grain free diet is fortified with vitamins, minerals, probiotics, and antioxidants. 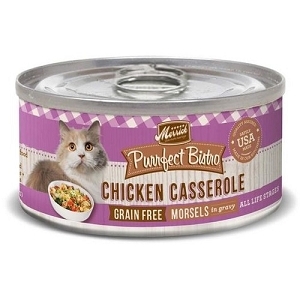 Not all brands make their own food. We put cooking and quality under one roof. Our five-star kitchen and manufacturing facilities uphold the strict guidelines well defined by the FDA. Our Merrick recipes are made using farm fresh ingredients locally sourced to ensure the highest quality. As a result, our recipes are 100% free of ingredients from China.